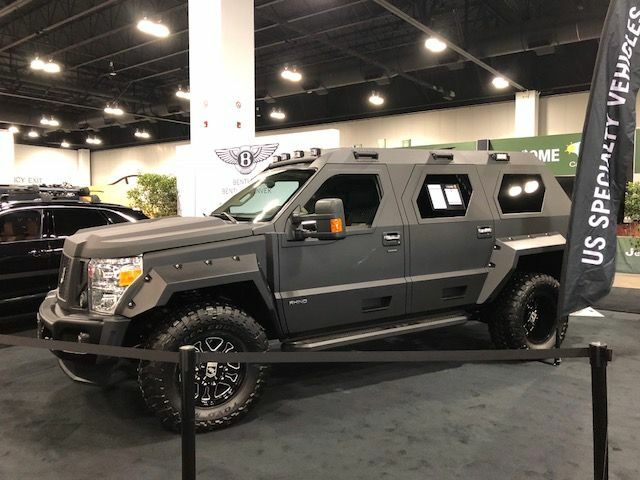 Walking through the Denver Auto Show, I was struck by the appearance of the Rhino GX. It is a massive vehicle perched on 38" Toyo M/T tires.This is why USSV calls the Rhino GX "the ultimate luxury SUV". It also looks like it would take you to a warzone if need be. The vehicle on display in Denver supposedly seats 7 people. It looks like it could carry an entire hockey team. No wonder the Rhino GX looks so big. It is big! According to the USSV team, the vehicle is hand built, in California, on a Ford F-450 Super Duty body. USSV adds a military strength steel body, special hydraulic suspension as well as different windows and doors. The Rhino GX at the auto show has a 6.7-liter Powerstroke V-8 diesel, but you can also get it with a 6.8-liter V-10 Ford engine. On the company’s website, it lists the GVWR as 14,000 pounds. In person, the Rhino GX looks more like a military vehicle than a Ford truck, but that is the intent. The behemoth is 225” long (over 18 feet), 96” wide (8 feet), and 88” high (more than 7 feet). It is not armor-plated, but apparently the company knows someone who will do that for you, if you desire. The Rhino GX includes all the latest bells and whistles, navigation, front and rear cameras, as well as a premium infotainment system. The “rugged road warrior” will cost you dearly. The textured paint alone is a $10,000 upcharge. The premium model on display in Denver stickers at a whopping $262,945 and that doesn’t include taxes and dealer preparation! It certainly is the SUV that will stand out in the crowd. The best thing about auto shows is that they let you dream big. I'm sure there are days on the highway that everyone would want a Rhino GX.